William (Y6) Treasurer, Evie and Tom (Y4), Toby and Lily (Y3), Ruby and Dan (Y2), Sam and Myla (Y1). School Council's Welly Walk was a great success. We are excited to see how much sponsorship money we receive. The School Council once again collected 'Love in a Box' shoe boxes for the Mustard Seed Appeal 2018. We collected 30 shoe boxes for under privileged children for Christmas. In 2017 we collected 52 boxes for underprivileged children throughout Eastern Europe. 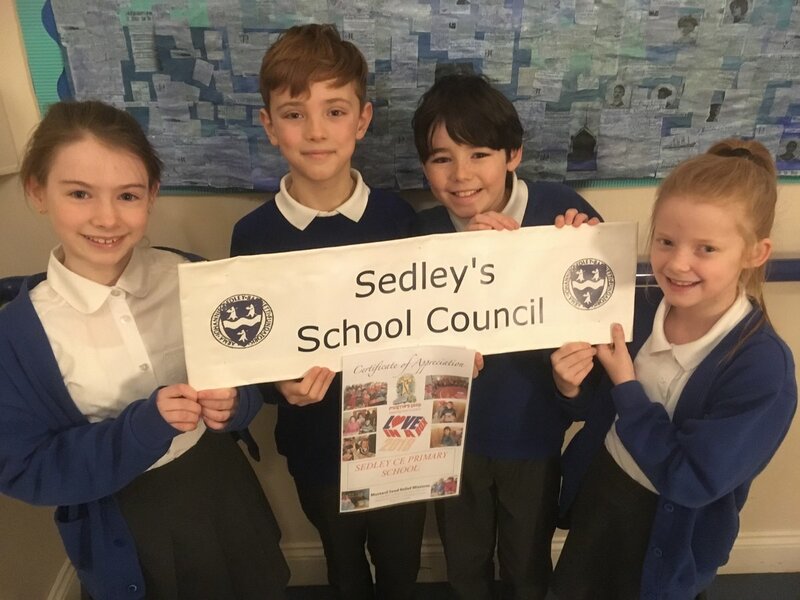 Sedley’s School Council is made up of a boy and a girl from each year group (years 1-6) voted by the peers in their class. Our School Council Representatives are very enthusiastic and engaged to adopt the responsibility of their School Council role. The School Council Representatives will meet twice every term and are responsible for voicing the opinions and needs of the children within the school over this academic year, they will also help to decide how any funds raised will be spent and which exciting projects will be organised in the coming year. assortment of balls for lunchtime play.